European or common starlings are one of the most common birds in the world, but because they have several different plumage molts, they can be confusing to identify at different times of the year. By understanding the changes these birds go through during different seasons and different points in their lives, birders can identify them easily. Tail: In all plumages, these starlings have short, stubby tails with dark feathers. The tail is typically held closed or only slightly fanned in flight. Wings: The breeding European starling's wings are dark with buff or brown edging, though the width of the edging can vary. Plumage: The plumage is overall dark and shiny but shows green and purple iridescent gloss in bright light, particularly on the neck. Small buff or whitish spots may still be visible on the body, or they could wear completely off by the breeding season. Bill: The starling's bill is stout and powerful, and during the breeding season, it is bright yellow in color. These birds probe into the ground seeking insects and other foods. Legs and Feet: The breeding starling's legs and feet are a bright red or orange-red, adding to the bird's colorful appearance. Plumage: While starlings still have their black plumage in fall and winter, after molting their feathers have broad buff or whitish tips that give them a heavily spotted appearance. These tips will gradually wear off, so the degree of spotting can vary throughout the season. Bill: The starling's stout, straight bill is a good clue in every plumage, but after the breeding season it loses the bright yellow color and is grayish black instead. Throat Colors: In good light, the green and purple iridescence on a starling's throat may still show in non-breeding plumage, even through the spotted tips of newly molted feathers. Legs and Feet: In fall and winter, the grayish-black legs and feet of the starling are more camouflaged than their brighter breeding colors, though a slight reddish tinge may still be visible, particularly early and late in the season. Tail: The tail is short and blunt, giving this bird a stubby appearance. Wings: The dark wings show buff or brownish edging that can be very prominent when the feathers are freshly molted. That edging will gradually wear off and become thinner. Like many passerines, young starlings are far less boldly marked than adult birds. This camouflage helps protect the young birds from predators, but birders who know the field marks to check can easily identify even fledgling European starlings. Plumage: Young starlings are a solid gray-brown color with relatively few markings or distinguishing features, and that overall plainness can be a good field mark. Bill: Even young starlings have the straight, stout bill characteristic of the species, and it is a dark gray-black color. Throat: A slightly paler throat may be visible on juvenile starlings, and may show faint dark malar stripes. Underparts: The underparts of the youngest starling fledglings show blurry dark streaks, but as the birds get darker those markings become harder to see. Tail: The short, stubby tail of the European starling is a good field mark at any age, though the tail may seem to be longer in young birds before they grow into their adult proportions. When young starlings molt, their appearance changes drastically and the mottled color changes can confuse birders of all experience levels. By knowing what clues to look for, it is easier to properly identify these teenage starlings. Young Plumage: As a young starling begins molting into its adult plumage, it will still have some patches of its dull brown-gray plumage. The head is often the last place to molt, giving the bird a hooded appearance, but patches of paler feathers may also be seen in the wings or body. Bill: The straight, stout bill of a European starling is a key field mark at any age and in any plumage. Young birds have dark bills until they are ready for their first breeding season. Adult Plumage: As molting continues, patches of shiny dark plumage with bold spots will appear on the bird's body, giving it a scruffy, incomplete appearance. When even just a few of these adult feathers are present, the bird's adult iridescence may be visible in good light. Tail: The stubby tail of a young bird looks much the same as an adult starling's tail and gives these birds a blunt appearance. European starlings (called common starlings in Europe) are one of the world's most numerous bird species, but with such bold differences between juvenile, breeding and non-breeding plumages, it can be confusing to identify these birds at different times of the year. 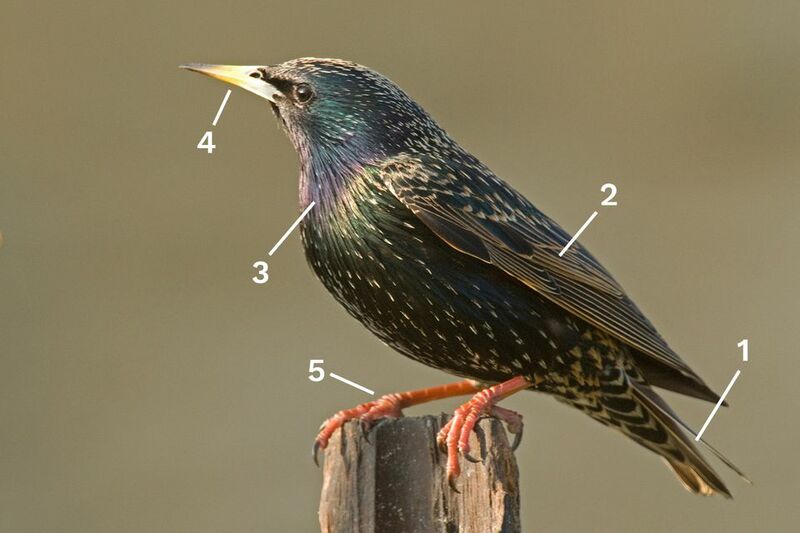 By understanding the key field marks for different ages and plumages, birders can avoid undue confusion whenever a starling comes to visit.